If you’re looking for beautiful, rugged house siding that will provide improved appearance and protection for your home in Rio Rancho, New Mexico, or any nearby community, then turn to the house siding experts at ABC Seamless of Albuquerque. We have served residents of the region since 1989, establishing ourselves as a trustworthy exterior renovation company and one of the most prominent residential construction experts in Rio Rancho, NM. We fabricate our siding panels using heavy-gauge, hot-dipped, G-90 galvanized steel – creating house siding that is thicker and stronger than any other siding on the market. It’s rugged enough to withstand impacts from hail, wind-blown debris, and other flying objects, providing an extraordinary level of protection for your home. 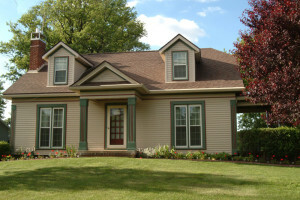 We will custom-manufacture your new siding onsite, using the precise dimensions of your home. This eliminates unsightly seams every 12 feet or so – seams that can drastically reduce your home’s energy efficiency. Not only do we eradicate the seams, but we will also wrap your home with premium insulation, making it easier to maintain a comfortable temperature inside your home all year long. Our house siding materials have several layers of automotive-grade protective coating, enabling our steel to resist cracking, peeling, chipping, fading, and other damage that can result from years of exposure to sunlight and harsh weather. Your home will never again look old or run down. To learn more about our extraordinary house siding, or to set up an appointment to speak with one of our representatives, contact us at ABC Seamless of Albuquerque today. We’re proud to serve homeowners in Rio Rancho, NM, and throughout the region.